Sushi eating etiquette is often perceived as an elaborate and formal process with a lot of rules, which it can be. Whether you are eating at a high-end sushi bar or a local Japanese place, the most important thing to remember is that you are there to enjoy a meal. If you are polite, considerate and enjoy the experience, you will have a great time and no one will be offended. The information that follows is intended to help you to understand, participate in and enhance your dining experience. If it seems like too much, just relax, enjoy your meal, and take it as it comes. It is polite in any restaurant to greet the host or hostess, who may greet you with the traditional “irasshaimase,” which means “please come in.” You only need to acknowledge their greeting and are not required to say anything back, other than to answer any specific questions about your evening, such as where you would like to sit or if you would like to check a coat. Feel free to greet the “itamae” (sushi chef) even if you don’t eat at the bar. You can request to be seated at the sushi bar if you are interested in watching your food being prepared or in making conversation with the itamae. If you have a party of three or four people and would like to eat at the sushi bar, it will make conversation much easier if you request corner seats at the bar so that all of your guests are facing each other rather than seated in a row. Even better, make a reservation for this spot in advance. The person who seated you or the waiter will generally take your drink order and may ask if you would like to order any appetizers, such as miso soup, edamame, or any items of the regular menu. They will also let you know whether to place your sushi order with them or directly with the sushi chef. Some diners feel that part of what makes sushi unique is the intimacy that develops between the chef and the customers. Becoming acquainted with the chefs, and returning to the same sushi bar repeatedly, is one of the best ways for a to expand and improve your experience. The chef is likely to serve the most interesting and highest-quality ingredients to regular customers. In many sushi bars, you can offer to buy the sushi chef or chefs a drink, generally a large bottle of beer, or whatever they are drinking. It is a polite, friendly gesture and a great way to meet and thank them. The Japanese can be hard drinkers, and you may find yourself talking to a loaded sushi chef at the end of a night. That being said, some sushi experts advise that the customer should keep a respectful distance from the chef. You can get a feel for how your sushi bar works by watching and just asking the chef if you can buy them a drink. At the beginning of the meal, you may be offered a small cloth or disposable towel (called an “oshibori”) which is either room temperature or hot. It is presented a number of different ways, including in a small bag with your place setting or handed to you by a staff person with a pair of tongs. Use the towel to clean your hands. It is a pleasant way to mark the beginning of the meal. When you are done, place the towel discretely on the side so that it can be taken away, or you can keep it to use as a napkin throughout the meal. Do not use the towel to wipe your face or blow your nose; these activities should generally happen in the privacy of the restroom and not in the dining area. There will usually be a set of chopsticks at your place setting. Japanese generally prefer disposable round hardwood chopsticks. The chopsticks should be removed from the paper sleeve and gently pulled apart. While it has become a commonplace to rub the chopsticks together to “get the splinters off,” this is considered impolite and should be avoided. A decent sushi restaurant will use high quality chopsticks that do not have splinters. Rubbing them together implies that the chopsticks provided by the sushi bar are of poor quality, which is not a great way to start off a meal. When not in use, chopsticks should be placed parallel to yourself on a chopstick stand (if there is one) or on the soy sauce dish or a small plate which may also be given to you. The chopstick tips should not touch the table. In Japan, people usually pair sushi with beer, sake and occasionally soju cocktails, or a combination of the three. Green tea and water are standard non-alcoholic choices. In general, your cup or glass should always be full. If you don’t want to drink any more, just leave a full glass. Many Japanese restaurants have fully stocked sake bars and, occasionally, a sommelier. Feel free to ask for recommendations when you order. 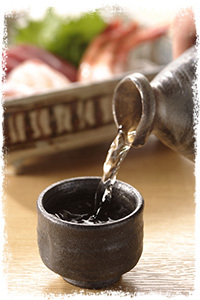 Quality sake is increasingly available and can be an integral part of a great sushi meal. With alcoholic beverages, it is customary for the waitperson to pour the drinks, or for the diners to serve each other, rather than pouring your own drink. Be attentive to your fellow diner’s glasses and refill them as needed. If you need a refill, drink the remainder of the beverage and hold the glass slightly and politely towards a dining partner or the waitperson. Traditionally, it is polite to hold up a glass or cup with two hands when it is being filled. Toasting other people in your party, and, occasionally, the sushi chef, is common as well. The traditional toast is “kompai” – which means “empty your cup.” Try to avoid saying “chin chin,” which in Japanese sounds like a reference to a certain male body part. Sake is available both chilled and hot, depending the quality and style. Experiment to learn what you like. In general, higher quality sake is served cold. Sushi bars typically have a narrow shelf above the sushi bar. When the sushi is ordered, the chef will place a rectangular stand, usually made of wood, on the shelf. This rectangular stand is called a “geta” because it looks like a traditional Japanese wooden sandal of the same name. Many sushi bars are replacing the geta with a simple rectangular plate. The stand or plate will be empty, except for small mounds of pickled ginger and wasabi. In Japan, diners leave the geta on the shelf, where the chef can place the fish directly on it. In the U.S., people generally take the geta and place it in front of them, or the chef will hand the geta or other plate directly to the diner. It is good form to take the plate with both hands and thank the chef. The chef will place orders of nigiri on the geta. If the nigiri comes with more than a dab of sauce, it will likely be served on a separate plate so that the geta will remain clean. There will generally be a small carafe filled with soy sauce on the bar, and small round or rectangular dishes near each place setting. You can pour a small amount of soy sauce from the carafe into the dish to use for dipping your sushi just before eating it. There are different grades and qualities of soy sauce. The soy sauce provided in virtually all restaurants will be a commercial grade product and often has a bitter, metallic taste from oxidation caused by exposure to air for long periods of time in n open carafe. Even worse, many restaurants top off the carafe at the end the night, which means some of the soy sauce in the carafe has been in the carafe since the last time it was emptied and cleaned, possibly when the restaurant first opened. Shiso Soy Sauce is guaranteed to be fresh when you open a bottle, which provides for optimal quality and the enjoyment of the best available soy sauce. 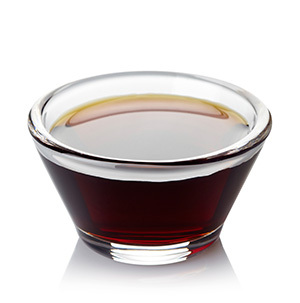 To serve Shiso soy sauce, open the cap, hold the bottle midway down on the sharp edges and, with the flat side of the bottle facing the table, pour the Shiso Soy sauce into the small dishes. Note the fresh, live yeast smell of the soy sauce when you serve it. I would suggest that you try both styles of Shiso Soy – the traditional Koikuchi recipe and Marudai style – at the same time, and also compare the Shiso soy to the soy sauce provided by the restaurant. Simply ask your server for additional soy dishes and place them side by side as you would in a wine tasting. See our other suggestions on how to taste and enjoy soy sauce. Gari, a pickled ginger served with sushi, is meant to cleanse your palate between various servings, particularly if the fish is strong or oily. It is not meant to be eaten in the same bite as a piece of sushi, and shouldn’t be eaten as an appetizer. If you finish the initial portion served with your plate, it is okay to ask for more. The quality of the ginger can vary greatly, and a quality sushi bar should provide delicious, well-balanced ginger with a light, clean color and flavor. Wasabi is a strong flavored root that is ground into a light green paste and served with sushi. It has an interesting, complimentary flavor and can help cut and balance the “fishy” flavor associated with stronger, oily fish. Wasabi is a member of the Brassicaceae family, which includes cabbages, horseradish, and mustard. 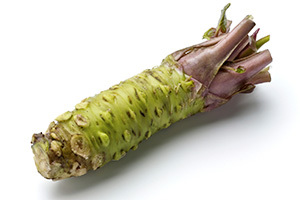 It is also referred to as “Japanese horseradish.” Wasabi can be freshly grated, which is generally the most flavorful, packaged in a tube, or reconstituted from a dried powder. Wasabi loses flavor rapidly when placed in liquids and should generally be consumed shortly after preparation. Some chefs, particularly in Japan, put the wasabi between the fish and the rice as they prepare it. Generally, the chef increases the amount of wasabi with toppings that have a high fat content. Many Americans stir extra wasabi into their soy sauce to increase the level of spiciness. Wasabi rapidly loses its spiciness and flavor when immersed in liquid. An alternative way to enjoy the wasabi is to pour the soy sauce into the soy sauce dish and place some wasabi in the corner of the dish so that it’s on the edge of the soy dish and not stirred into the soy sauce. Using your chopsticks, swirl the wasabi around in a small area. This is so you can choose to use more or less wasabi as you see fit. 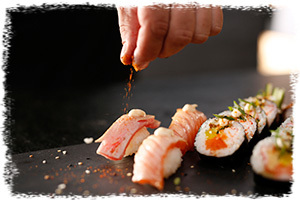 Wasabi can be added directly to the top of the sushi before dipping the piece into the soy sauce as well. The “heat” of wasabi is more similar to mustard than the capsaicin in a chili pepper. Wasabi produces vapors that stimulate the nasal passages more than the tongue. If you get blasted with too much wasabi, try breathing in through your nose and out through your mouth to relieve the burning sensation. If the sushi bar is busy, there may be a fair amount of time between being seated and the arrival of your sushi. Ordering drinks and appetizers from your server can fill the time and allow for a pleasant transition into the meal. The most common appetizers are edamame – salty, cooked soybeans served in the shell – and miso soup. 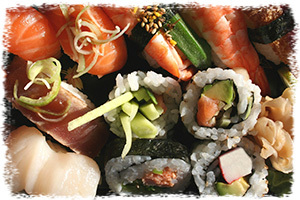 Sushi is a generic term for traditional Japanese cuisine that includes raw fish. Sashimi means a simple piece of cut, uncooked fish. It is generally the highest quality, and most expensive portion, of the fish available. 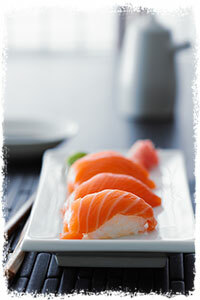 Nigiri means a piece of fish, or some other seafood, on top of seasoned rice. The rice is a special, short-grained rice seasoned with sweet rice vinegar and salt. The order in which you eat different types of fish is not crucial, but it is generally better to begin with leaner, lighter-tasting fish and progress towards fish with stronger flavors and higher fat content. At most sushi bars, when you order nigiri, the chef will make two pieces per order. It is increasingly common in expensive restaurants to provide only one piece of nigiri per order – it is a good idea check the menu to avoid sticker shock when the bill arrives. The itamae may have special or unusual items that may or may not be listed on a board near the sushi bar. Feel free to ask for things not listed in the menu. Itamae often have such special items for guests who ask. Vegetables have always been an important component of sushi, and many traditional varieties are mostly or completely vegetarian. From kappa maki (cucumber roll) to sophisticated nigiri ensembles, itamaes create interesting and delicious vegetarian sushi. If you’re a vegetarian, join your fish-eating friends and just let the itamae know about what you like. Most itamaes will go out of their way to create custom vegetarian sushi to suit your tastes and needs. Okimari means, “It’s been decided” and is similar to a Chef’s Choice or Prixe Fix menu in other restaurants. It is basically a sample menu at a fixed price, with all of the sushi served at one time. The price, and possibly the type of sushi, will generally be listed on the menu. Omakase means, “I leave it up to you” and leaves the selection to the sushi chef. Omikase is different from Okonomi in that each meal is different and, hopefully, tailored to the tastes of the diner. 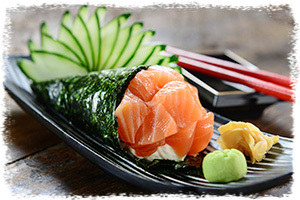 Omakase provides an opportunity for the chef to provide the best possible selection for you. If you are comfortable speaking with the sushi chef, you can let the chef know what you enjoy and how adventurous you are feeling. The price may be set in the menu or based on what you are served. The chef may include other small dishes to augment the sushi. A word of advice: Generally, when you order Omakase, it indicates that you are not overly concerned with the price of the meal and are prepared to accept a high level of expense. Okonomi means “as I like it” and is similar to ordering a la carte. It is the most common way to order sushi. You ask the sushi chef (or the server) for types of sushi as your meal progresses. If things are busy, you will be better off ordering a number of pieces at once to avoid having to wait for an opportunity to order again. When you are ready to order, a polite approach to find out the chef’s recommendations is to ask if they have anything special or unusual, or if the chef has any suggestions. It is bad form to ask the sushi chef what is “fresh” or “good today” as it implies the itamea may serve something that is not fresh or good. Respect the itamae who is often quite busy, in much the same way you approach a bartender in a busy bar. Pace yourself, and watch the itamae; order when he is not in the middle of doing something else. But feel free to engage in conversation if he is able. This is also a good way to build a rapport with him and you may enjoy the rewards later as a regular. Keep your tastes in mind and order accordingly, as it is impolite to leave food on the plate after your meal or respond as though a particular item is “gross” if you don’t like it. When you receive your plate of sushi, first look at what is being served, the number and kind of pieces, and think about the order in which you are going to eat them. 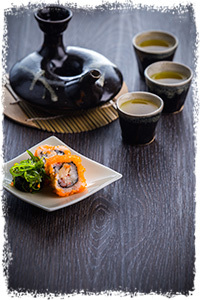 Traditional sushi rolls—with the seaweed on the outside—should be eaten first, before the seaweed gets soggy. If the chef serves a platter, the rolls with seaweed on the outside should be eaten before the nigiri. Sushi should also be eaten as soon as the chef serves it, so that it can be enjoyed at the proper temperature, while the rice is still slightly warm. Sushi may be eaten with chopsticks or your fingers. Obviously, the formality of the sushi bar and company should dictate the proper etiquette, with chopsticks used in more elegant settings. Traditionally, the entire piece of sushi should be eaten in one bite. It is neater and easier. The sushi may be eaten in two bites if you prefer. More than that runs the risk of the entire piece disintegrating on the way to your mouth, which can make a mess. The tradition of eating sushi in one bite is declining in the U.S. as the portion size has tended to increase (along with the price) as sushi becomes more popular. The sushi should be gently dipped in soy sauce, preferably with the fish being the portion covered with the soy sauce rather than the rice. Dipping the fish enhances the flavor of the fish more directly, and prevents the ball of rice from soaking up too much soy sauce and disintegrating. 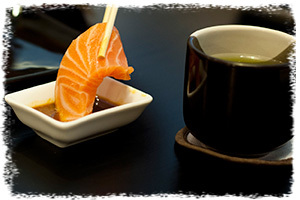 Soy sauce should not be added if the sushi has been prepared with a sauce or other condiments, such as a barbeque sauce on eel or a combination of flavors on a fresh scallop. Not all types of sushi are appropriate for soy sauce. If the sushi is already dressed, the sushi chef has presumably prepared what they believe to be the optimal balance of flavors. You should feel free to ask the chef if an item should be eaten as served or with soy sauce. Some types of sushi are best eaten with your hands. 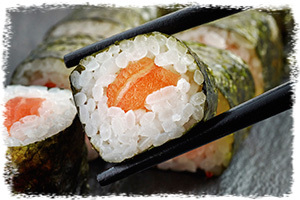 A good nigiri, for example, is not packed tightly and should gently fall apart in your mouth, which means chopsticks are likely to break it apart. Most sushi bars provide each customer with a damp cloth, and wiping your fingers between each type of nigiri should be sufficient to keep the flavors separate. The etiquette for eating sashimi is a bit different. Sashimi, slices of raw fish without rice, should always be eaten with chopsticks. Chefs serve a small mound of wasabi on the side with sashimi. To avoid losing the spiciness and flavor of the wasabi by mixing it with liquid, dab a bit of wasabi directly onto the slice of fish with your chopsticks, then dip a different corner of the fish in soy sauce. The garnishes that come with sashimi, usually a green shiso leaf and shredded daikon radish, are meant to be eaten. There has been a fair amount of discussion about whether and how to dip sushi in soy sauce. Traditionally, only the fish (and not the rice) is dipped in the soy sauce. The idea is to prevent the rice from absorbing large amounts of soy sauce, which will drown the flavor of the fish and cause the rice on the nigiri to fall apart and otherwise become difficult to eat. On the other hand, it takes some fairly advanced chopsticks skills to flip the sushi over, dip it fish side down, and make it back to your mouth. Americans generally enjoy using more soy sauce on their sushi than the Japanese, who are often appalled at the sheer amount of soy sauce a typical American diner will consume during a meal. I suggest trying to eat sushi both ways – with the fish dipped in the soy sauce and with the rice dipped. See which you prefer. If you are using your hands, it is much easier to dip just the fish. As a general rule, eat the sushi in one or two bites. 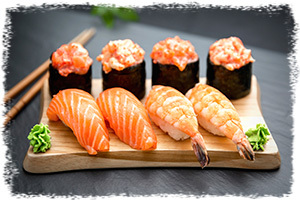 The size of the fish component of sushi has generally been increasing in the United States as the price goes up, which makes it difficult or unpleasant to eat a whole piece of nigiri in one bite. There is also a tradition of placing the fish side on the nigiri on your tongue first to maximize the flavor of the fish. Again, this is a tradition that requires a lot of dexterity and, when combined with dipping the fish side, can make the whole process overly difficult and interfere with your enjoyment of the meal. My suggestion is that you feel free to try different ways and do what seems best to you. If the fish has a strong taste like katsuo and saba (skipjack tuna and mackerel), eat some of the gari (pickled ginger) to cleanse your palate when you have finished it. There are a lot of traditional rules associated with eating sushi. My sentiment is that you are eating sushi to have a great dining experience, not to partake in an elaborate, stressful historical ritual. To that end, if you enjoy your meal and treat everyone politely and with respect, you will be fine. If you are in a very formal setting, or would enjoy following some of the traditions, a list of some common Japanese etiquette follows. Do not pick up a piece of food from a common plate or another person’s plate with the end of the chopsticks you put in your mouth. When touching other people’s food, flip your chopsticks around and use the fat ends that you normally hold to touch the food. Never pass food to another person using chopsticks as this is symbolically similar to the passing of a deceased relative’s bones at a traditional Japanese funeral. Pass a plate instead, allowing the other person to take food offered. Eat nigiri style sushi in one bite. As noted above, this is not always easy (or possible) in North America where some itamae prepare huge pieces. Traditional itamae in Japanese will make the pieces that are easy eat in one bite. Do your best and don’t worry if you can’t manage it. Slurping noodles is permitted, less so for soup, at least by Japanese standards. Belching is never polite. In more traditional restaurants, if you are not given a spoon for your soup, do not ask for one. You are expected to pick up your bowl to drink the soup, using your chopsticks to direct the solid pieces to your mouth. Never stick your chopsticks in your rice and leave them sticking up. This resembles incense sticks and again brings to mind the symbolism of the Japanese funeral and prayers.